2012, Turtleback Books, Boston Mass. Despite some early chapters that had some merit, the book becomes laden with prolixity and pseudo-intellectualism. It is also a violent and disturbing read and I found little value in dragging in human cannibalism nor scenes of a father teaching a young son about the cruelty of nature by feeding a young goat to a tiger, As to the attempt to give the narrator three differing and mutually exclusive faiths, it is not only unbelievable but insulting. This a deeply flawed and mess of a novel. The 2 star rating I have given this book implies nothing about the allurement held within its pages. The beautiful plot (based on a true story) is one of the best ever written. It *could* have been my new favorite novel. What ruined it for me? The foul language. Sadly, there was much of it mixed in. So much that my 5 star rating had to drop down to only 2 measly stars. The story itself is (as I have already mentioned) BEAUTIFUL. It starts in Pondicherry, India, with Piscine Molitor Patel, the son of a zookeeper. The chapters fly by with colorful descriptions. Vibrancy illuminates off the pages. Then---the shipwreck, and the endless weeks spent at sea. So accurately written. Every detail that one could think of has been packed into this novel. Yes, there are gruesome parts. "Life of Pi" is not intended for the weak in stomach, heart, or imagination. But learning about this struggle for survival is well worth it. Religious notes: Atheism is mentioned a few times. Also, in addition to Christianity, the religions of Hinduism and Islam are discussed in much detail. As a Christian myself, I naturally desired the Christian aspects brought up in the storyline, and found the details of the other religions quite interesting, to at least learn about. Overall, I found the book to exude such a memorizing tie that led me to relish in the story, actually wishing that I was there experiencing the hardships of trying to live at sea. Again, I say, it's a beautiful book. If the foul language didn't have to mess it up for me, I would have gained a new favorite. 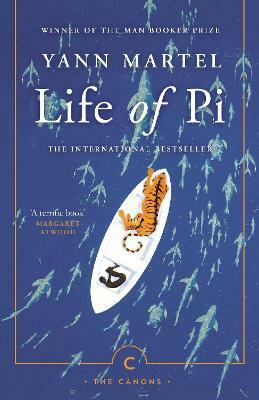 Many of us have read Life of Pi in soft-cover or hard-cover editions. The illustrated edition is for those who want to keep the book on their shelves forever and ever. The copy I received is in perfect condition: I couldn't be more pleased. Appreciated the remarkably short time between ordering and receiving the book which was in perfect condition. Astonishing book -- bought a second copy! The youngster whose tale is told in this book was already a fascinating person before he found himself adrift in a lifeboat in the Pacific with no one but a quartet of zoo animals, including a 450-pound Bengal tiger. I was so impressed, I bought an extra copy to lend to friends.